My copy of the Times Higher arrived a little late this week, so I’ve only just seen the latest evidence that the Westminster government’s plans for English Higher Education are degenerating into farce. For a start it seems that the government made a serious error in believing that the Office For Fair Access (known to its few friends as OFFA) actually doesn’t have the legal authority to impose fee levels on universities. The government had assumed that they would be able to prevent all universities charging the maximum £9K allowed under the new rules. But they can’t. Since the increased tuition fee is being offset by cuts of up to 80% in teaching budgets it’s no surprise that universities want to maximise the income from fees. Oxford, Cambridge, Imperial College and UCL have all already indicated that they will go for the maximum, which isn’t surprising since these are among the leading universities in the country. It may be that some universities, perhaps from the ex-Poly sector, might try to go for the `pack ’em high and sell ’em cheap’ approach to undergraduate degrees, but a more challenging issue is what the middle-grade universities will do. Will they try to compete on price, or will they fear that charging less than £9K will get them branded as second-rate? However, if all universities charge £9K – which has always seemed to me to be the most likely outcome – then this costs the government much more than it anticipated, because it has to provide a much higher amount in loans. David Willetts has argued that the £9K limit is `difficult to defend’, claiming that despite the cuts a fee of this size would lead to a 40% increase in teaching resource. This isn’t actually true because universities will have to devote a large slice of the fee income to supporting less-well-off students and they are also being hit by huge cuts in capital funding, which will have to be made up some way. Methinks Willett’s famous two brains might have got their wires crossed. Whether the £9k level is defensible or not, the government appears powerless to stop universities charging it, so is threatening to penalise research grants or to cut the number of student places if too many try it. This looks like panic to me. The current state of British Higher Education policy is difficult to defend in other ways too. In among the figures spun out by Willetts is one that reveals that 80% of UK students are in subjects outside the area of Science, Technology, Engineering and Mathematics (STEM), which attract a lower level of central funding than STEM disciplines. However, the differential is not as large as you might think: there’s only a factor two between the lowest band (D, including Sociology, Economics, Business Studies, Law and Education) and the STEM band B (including my own subject, Physics). The real difference in cost is much larger than that, and not just because science subjects need laboratories and the like. To give an example, I was talking last week to a student from a Humanities department at a leading University (not my employer). Each week she gets 3 lectures and one two-hour seminar, usually run by a research student. That’s it for her contact with the department. In my School, a typical student can expect around 20 contact hours per week including lectures, exercise class, laboratory sessions, and a tutorial (usually in a group of four). The vast majority of these sessions are done by full-time academic staff, not PDRAs or PhD students, although we do employ such folks in laboratory sessions and for a very small number of lectures. It doesn’t take Albert Einstein to work out that 20 hours of staff time costs a lot more than 3, and that’s even before you include the cost of the laboratories and equipment needed to teach physics. In the current system, however, students pay the same fee for STEM and non-STEM subjects. This situation not only works as a powerful disincentive for a university to invest in expensive subjects, such as physics, but also rips off arts students who are given very little teaching in return for their fee. It is fortunate for this country that scientists working in its universities show such dedication to teaching as well as research that they don’t try to do what our cousins in the arts do. I sense a growing consensus, however, that we’re being ripped off too. I suppose it could be argued that the big cuts in teaching grant in England do something to redress this anomaly, as the central funding element for Arts & Humanities subjects is cut to zero in the new funding regime. On the other hand, however, if universities do charge £9K for all subjects then the differential between arts and sciences will turn out to be lower than 2:1, as the central funding element for STEM subjects is far less than £9K. On the other other hand, if STEM subjects were to charge a higher fee than the others then demand would probably collapse. To get another angle on this argument, consider the comments made by senior members of the legal profession who are concerned about the drastic overproduction of law graduates. Only about half those doing the Bar Professional Training Course after a law degree stand any chance of getting a job as a lawyer in the UK. Contrast this with the situation in science subjects, where we don’t even produce enough graduates to ensure that schools have an adequate supply of science teachers. The system is completely out of balance. I don’t see anything in the post-Browne era that will alter this ridiculous situation. STEM subjects will continue to be strangled and universities will continue to overproduce graduates in other areas. Somebody has to get a grip. I doubt the Westminster government is capable of doing this. It has already delayed its planned White Paper on Higher Education, providing yet another indication that it has completely lost the plot. Or maybe it’s making a complete botch of the situation deliberately, as part of a cunning plan to encourage universities to go private? Did HE fall, or was it pushed? One of the other scary bits of news to emerge last week concerns proposed changes to the arrangements for tuition fees in English universities. According to the Times Higher, the Minister responsible for universities, David Willetts, has admitted that the cuts to university budgets announced in the Comprehensive Spending Review, will occur before any new money flows into universities from whatever new fee arrangements emerge from the government’s deliberations following the Browne Report. One of the recommendations of the Browne Report was that central government funding for arts, humanities and social sciences be scrapped entirely. Although I’m a scientist and I do think Science is Vital this is a very bad move, as I think other forms of scholarship and learning are vital too, for a wide range of reasons including cultural ones. It was never clear whether arts & humanities departments would be able to recoup the money lost as a result of cuts to central funding, but now it appears they will have to survive for an indeterminate time without any prospect of extra income to offset the shortfall. You have to expect that there will be pressure on universities to save money, and we don’t think they should be exempt from the pursuit of efficiencies. Can an immediate 40% cut in teaching income be made by efficiency savings? I don’t think so, Mr Willetts. Even making large-scale redundancies won’t help there, as that costs a lot of money up front. So why is the government pushing through cuts to university funding before ensuring that the new fee arrangements are in place? A variety of answers are possible. One would be incompetence, always a possibility when politicians are involved. However, although this government has tried to rush things through very quickly, I do not believe that this is something that hasn’t been considered very carefully. I think it’s deliberate. I believe that this government wants some universities to fail, and has found an opportunity to push them over the edge. It’s not about efficiency savings, it’s about survival of the fattest. Only those places able to dig into their reserves for several years will be able to weather the storm. Some will cope, some won’t. That’s the point. It’s well known that several universities, most of them post-1992 institutions, have been struggling financially for a considerable time. In the past, special procedures have always been implemented to protect organizations of this type that have been close to insolvency. This government has said that will do things differently, and that universities that go bust will now be allowed to fail. This may involve them closing altogether, or being taken over by private companies. If I were working in a university heavily dependent on income from arts, humanities and social science teaching, I would be extremely nervous about the future. I mean, more nervous than I am anyway, working as a scientist in an institution which is financially sound. And that is already very nervous indeed. The other side of this particularly nasty coin, is that more “prestigious” institutions specialising in non-STEM areas, such as the London School of Economics, are already considering the option of going private. If the government gives them no support directly, yet insists – as seems likely – in capping the fee students pay at a figure around £7K per annum as well as strangling them with yards of red tape as HEFCE is wont to do, then why not just withdraw from the system and set fees at whatever level they like? It’s unlikely that an institution with a strong science base will go down this road, as the taxpayer is going to continue supporting STEM subjects, but it seems to me that it would make sense for the LSE to opt out of a system whether the costs of membership exceed the benefits received. In the longer term, the squeeze is set of continue. 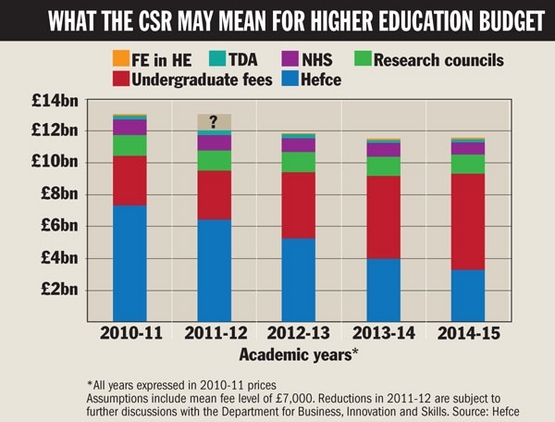 According again to the Times Higher, the net revenue from fees will only replace part of the funding withdrawn over the CSR period. It looks like five years of struggle during which many departments may go under. The more you think about it, the worse it looks. However, perhaps a better question than the one I asked a couple of paragraphs ago is the following. Why is the government intent on slashing the budgets of HE institutions, when it appears to have let Vodafone off without paying a bill for £6 billion tax? I’m basically in purdah this week, shuttling to and fro between Cardiff and Swindon on the business of the STFC Astronomy Grants Panel. However, I couldn’t resist a brief early morning post about yesterday’s news about the report on higher education funding by Lord Browne. I haven’t had time to read the report in full, so won’t comment in detail on it, but a few things did strike me from what I’ve picked up from the media. Perhaps others will add their views through the comments box. For a start it’s quite amusing how far wide of the mark most of the rumour-mongering about the report’s recommendations has been. In fact the proposals are far more radical than had been touted. The suggestion of lifting the cap on fees entirely, and allowing universities to decide how much to charge for tuition, will delight the so-called “elite” universities, but will alarm those (like me) who worry about the impact on students from poorer backgrounds. Most difficult, however, as far as I’m concerned will be the impact on middle-grade universities who won’t know where to pitch themselves in the free market that such a move would create. We know that Oxbridge will be able to get away with charging pretty much whatever they like, and many of the former polytechnics will clearly go for the budget end of the market, but in between there will be tricky decisions to make. The increased fee is to be offset by a cut of a whopping 80% (from £3.5bn to £0.8bn) in the teaching grant to English universities. A cut of this scale may well mean that some courses do not receive any direct contribution from the taxpayer at all (the so-called “unit of resouce”). If this goes ahead it will undoubtedly lead to course closures across the country. Although I would oppose a blanket cut of this scale, I’m not against the idea of withdrawing support from Mickey Mouse courses and concentrating it on important subjects. It seems likely, and indeed there are already signs, that full implementation of the Browne proposals will be politically difficult for the ConDem coalition. In fact, unless some of the recommendations are diluted, this may well lead to a full-scale revolt. We’ll have to wait and see. Vince Cable has endorsed the report, despite his own party’s previous opposition to raising tuition fees. Any resisual respect I had for him is going down the plughole very rapidly indeed. Finally, I’ll just point out that, even if they are fully implemented, the draconian cuts to English higher education funding are not necessarily going to be replicated here in Wales (or in Scotland or Northern Ireland). The Welsh Assembly has issued a statement on the Browne report, but clearly doesn’t know what to do about it. If they make good decisions now, Welsh universities could prosper by bucking the English trend, but if they get it wrong…. Anyway, that’s all for this am. Got a train to catch!